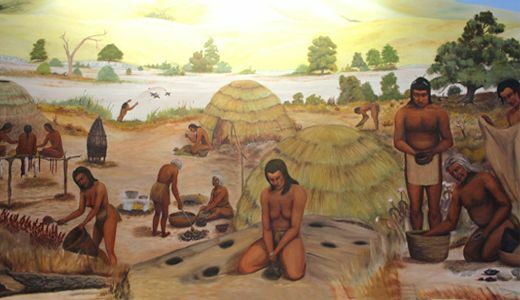 Sac – The Sac or Sauk tribe were one of a number of Algonquian tribes whose earliest known location was on the Michigan peninsula, the other tribes being the Potawatomi, Mascouten, and the Fox. Their own name, Osakiwug, means “people of the yellow earth. They later merged with the Fox Tribe becoming the Sac and Fox Tribe. See full article HERE. 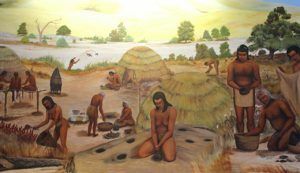 Sac and Fox – The historic Sac and Fox were once two separate tribes who were both Algonquian tribes whose earliest known location was on the Michigan peninsula. The separate tribes of the Sac and Fox were always closely allied and speak a very similar Algonquian language. Today they are one tribe who live in Oklahoma, Kansas, Nebraska, and Iowa. See full article HERE. 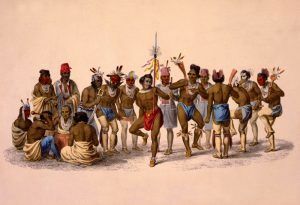 Saconnet – A small tribe living near Sakonnet Point, Rhode Island who were connected with the Wampanoag or the Narraganset. 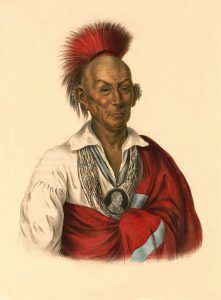 Under the woman chief, Ashawonks, they took the side of the English in King Philip’s War of 1675 and later, their land was purchased by the whites settlers. In 1700, they numbered about 400; but in 1763, they were visited by an epidemic which considerably diminished their numbers, so that by 1803, they had dwindled to only about a dozen people, living near Compton. Sahehwamish – Belonging to the coastal division of the Salishan linguistic stock, the lived in several bands on the innermost inlets of Puget Sound. They were estimated to have numbered about 1,200 in 1780 but had been reduced to about 780 by 1907. Salinan People – The Salinan people were a linguistic stock of California, who lived along the Salinas River, in what is today, San Luis Obispo and Monterey Counties. After missions were established for them in the late 1700s, they died off drastically and by the early 1900’s they numbered only about 20 people. Today there are still Salinan descendants living in California but there are no federally recognized tribes. See full article HERE. Salish/Flathead – This large and powerful division of the Salishan family, to which they gave their name, inhabited much of west Montana centered around the Flathead Lake and valley. Today, the Salish, along with the Pend d’Oreille and the Kootenai tribes, by the Treaty of Hell Gate on July 16, 1855, ceded to the United States their lands in Montana and Idaho. Today, they form part of the Confederated Salish and Kootenai tribes who live on the 1,317 million acre Flathead Reservation in northwest Montana. See full article HERE. Saluda – A small tribe that originally lived on the Saluda River in South Carolina, they moved to Pennsylvania in the early 18th century. They may have been connected with the Shawnee tribe. Samish – A Salishan division formerly on a river and bay of the same name in Washington. They were moved to the Lummi Reservation in western Whatcom County, Washington. Sanpoil – A group of Salishan Indians who lived on the Sans Poil and Columbia Rivers below Big Bend, Washington. They were comprised of a band of Spokane and a band of the Okinagan tribes. In 1905 they were reported to number 324, living on the Colville Reservation, but in 1909, their population had been reduced to only 178, which may have been due to a clerical error. No treaty was ever made with these Indians for their lands when the Government taking possession of their country. Santiam – A Kalapooian tribe formerly residing on the river of the same name, an eastern tributary of the Willamette River in Oregon. They were removed to the Grande Ronde Reservation, where, in 1906, they numbered only about 23. Just three years later, in 1909, they reported to number only five people, the remainder evidently having received patents for their lands and became citizens. Saponi/Sappony – The Saponi or Sappony are an eastern Siouan tribe, who have long lived in North Carolina and Virginia. Their language appears to have been the same as the Tutelo to the extent that the people of the two tribes could readily understand each other. Today, there are three groups of Saponi recognized by the state of North Carolina. See full article HERE. Saturiba – A Timucuan tribe in Florida they occupied both sides of lower St John River northward to the Satilla River in Georgia in 1565. They were at war with the Timucua, their nearest neighbors higher up on the river, and afterward, also warred with the Spaniards. However, they welcomed and aided the French during their short stay in the area. Their chief was said to rule 30 sub-chiefs, each perhaps representing a different village. The name may have been properly that of the head chief rather than of the tribe, the two being frequently confused by the early explorers. All the Indians of this region were Christianized by Franciscan missionaries before the end of the 16th century. Satsop – A Salish division who lived on the on Satsop River in Washington. They are usually classed under the collective name of Lower Chehalis. 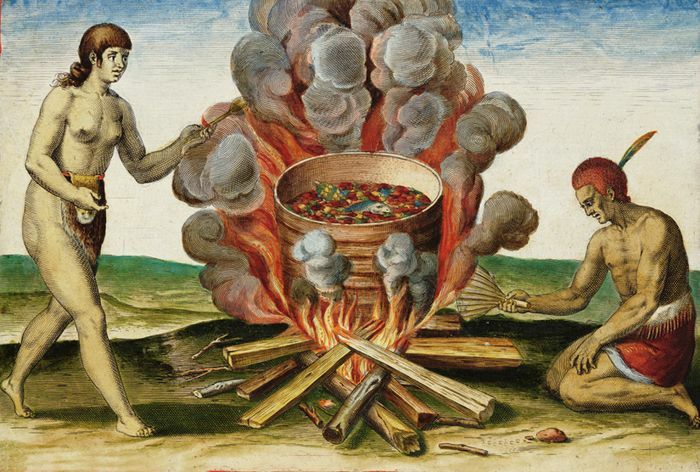 Saturiwa – Connected with the Utina tribe, they lived about the mouth of the St. Johns River in Florida and perhaps, on Cumberland Island. The chief of this tribe ruled over 30 subchiefs, but it is uncertain whether these subchiefs represented villages belonging allied tribes, the Saturiwa tribe, or both. They were visited by Jean Ribault in 1562 and probably by earlier explorers. Fort Caroline was built in the territory of the Saturiwa, who were friendly with the French until they were dispossessed by Spain. 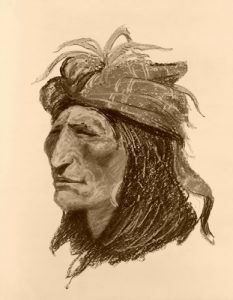 The chief, known as Saturiwa at this time, assisted Dominique De Gourgues in 1567 to avenge the destruction of his countrymen. The Spaniards espoused the cause of the Utina tribe against Saturiwa ten years later. The tribe soon submitted to Spain, however, and was one of the first missionized, its principal mission being San Juan del Puerto. Like the other Florida Indians, they suffered severely from disease in 1617 and 1672. The name of their chief appears among those involved in the Timucua Rebellion of 1656, and the names of their missions appear in the list of Bishop Calderon in 1680. However, afterward, nothing more of them was recorded. Sawokli – Belonging to the Muscogean linguistic stock, they formerly lived on the Chattahoochee River in the northeastern part of the present Barbour County, Alabama. A Spanish mission, Santa Cruz de Sabacola, was established in among one section of the tribe by Bishop Calderón of Cubain 1675, and missionaries were sent to a larger body among the Creek tribe in 1679 and again in 1681. Most of the Indians surrounding these; however, soon became hostile and those who were Christianized withdrew to the junction of the Chattahoochee and Flint Rivers, where they were settled not far from the newly established Chatot missions. The Sawokli appear to have remained in the same general region until 1706 or 1707, when they were displaced by hostile Indians, probably of the Creek tribe. In the early 1700’s they split up into several settlements but followed the fortunes of the Lower Creek Indians. In 1750, they were reported to number about 50 men living in four settlements, and in 1832, they numbered about 187 people.